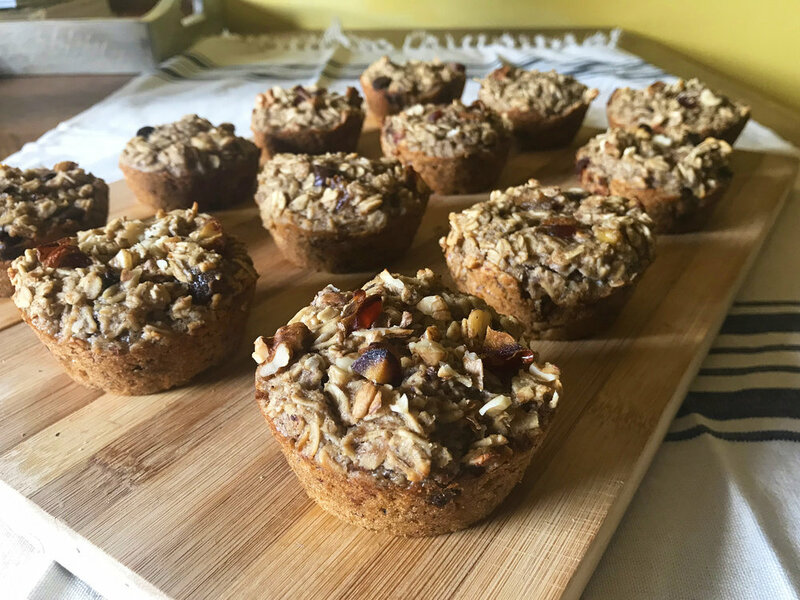 My recipe was inspired by the Kitchn's baked oatmeal cups, a naturally gluten-free recipe. I chose to make this recipe vegan as well by substituting flax seeds for eggs. If you're looking for a choose-your-own-adventure type of recipe, this one's for you. In the ingredients list below you’ll find some of our Co-op’s most affordable ingredients: banana, oats, and scant amounts of flax, dates and walnuts which are available in the bulk section. And finally, there's tahini, an earthy, versatile seed butter. I recommend trying our Soom tahini, which is made from single-sourced Ethiopian White Humera sesame seeds. Tahini is a superfood, full of protein, omega 3 and 6 fatty acids, iron, and calcium. It carries more savory flavor notes than almond or peanut butter, and for this reason, it's excellent blended into smoothies and baked goods like these. Heat your oven to 350 degrees. Grease one 12-cup muffin pan with a neutral oil or cooking spray. In a large mixing bowl, whisk together the eggs or flax eggs, milk, mashed banana, tahini, honey, and vanilla extract. Next, add in the oats, baking powder, salt, dried fruit, and nuts. Mix with a wooden spoon or spatula until well-combined. Scoop about ⅓ cup of batter into each well of the muffin tin. Each one should be filled to the top. Drop chocolate chips into each muffin well, pressing gently into the batter. Bake for 25–30 minutes, until the tops are slightly golden. Let cool in the tin for 5 minutes and remove to a cooling rack.